In music terms, cadence is a series of chords marking the end of a section; a harmonic close; a point of rest. In life we could call it an end of an era. Unfortunately, we often are so busy looking forward to what's to come, or the next best thing, that we forget to enjoy the moment that we're in. Cadence is worked in an Aran weight yarn and almost entirely in Stockinette stitch. It could easily be whipped up over a long weekend. But just be sure that as you speed along to the finish, you appreciate the rhythm and calm of every knit stitch. Cadence is worked from the top down, in one piece. 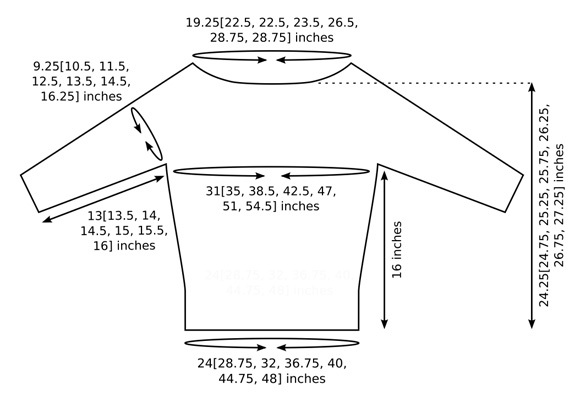 If your measurements are between sizes, I recommend making the smaller size, as the sweater is designed to be fitted. Try it on as you go to make adjustments for a perfect fit. The charts for this pattern is very large and fits on a letter-sized page. Using circular needle, CO 72[84, 84, 88, 100, 108, 108] sts. Place marker and join to begin working in the round, being careful not to twist; use marker which is different from the others, to indicate end of round. Set-up Round: *K2, [p2, k4] 3[4, 4, 4, 5, 5, 5] times, p2, k2, place marker; k2[2, 2, 3, 3, 5, 5], p2, k4, p2, k2[2, 2, 3, 3, 5, 5], place marker; repeat from * once. Next Round: *K2, [p2, k4] 3[4, 4, 4, 5, 5, 5] times, p2, k4[4, 4, 5, 5, 7, 7], p2, k4, p2, k2[2, 2, 3, 3, 5, 5], repeat from * once. Repeat this round 5 times more. Important: Read ahead! Chart patterns, sleeve shaping, and front/back shaping are worked at the same time, beginning on the next round. All round counts in yoke shaping begin on the next round. 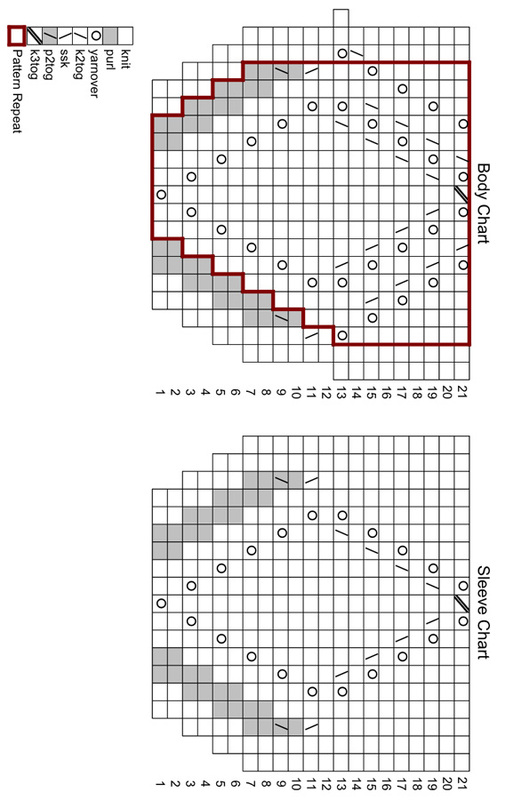 Work increased sts in stockinette st.
Next Round: *Work Round 1 of Body Chart to first marker, working outlined repeat section 3[4, 4, 4, 5, 5, 5] times; k0[0, 0, 1, 1, 3, 3], work Round 1 of Sleeve Chart , k0[0, 0, 1, 1, 3, 3]; repeat from * once. 80[94, 94, 98, 112, 120, 120] sts. This round establishes chart patterns for yoke. Continue working in pattern until all rounds of chart are complete, then continue in stockinette st.
Work 3[3, 2, 2, 2, 2, 2] rounds in pattern. to 1 st before next marker, m1, k1; repeat from * once. 4 sts increased. Repeat these 4[4, 3, 3, 3, 3, 3] rounds 7[9, 11, 12, 14, 14, 17] times more. For this size, all front/back increases are worked within chart. When all rounds of chart are complete, work front/back sts in stockinette st until sleeve shaping is complete. Work 11[-, 21, 6, 24, 7, 5] rounds in pattern. pattern to next marker, slip marker; repeat from * once. Repeat these 12[-, 22, 7, 25, 8, 6] rounds 2[-, 1, 5, 1, 5, 8] times more. When all increase rounds for both sleeves and body have been worked, there will be 186[214, 230, 254, 278, 302, 326] sts: 35[39, 43, 47, 51, 55, 61] sts for each sleeve, and 58[68, 72, 80, 88, 96, 102] sts each for front and back. K 2[1, 0, 4, 0, 4, 1] rounds. Next Round: K to first marker, remove marker, place next 35[39, 43, 47, 51, 55, 61] sts (all sts to second marker) on stitch holder or waste yarn, leaving marker, in place; k all sts to third marker, remove marker, place last 35[39, 43, 47, 51, 55, 61] sts on stitch holder or waste yarn, leaving end-of-round marker in place; join to continue working in the round. 116[136, 144, 160, 176, 192, 204] sts. Next Round: [K1, k2tog, k to 3 sts before marker, ssk, k1] twice. 132 sts. Decrease Round: [K1, k2tog, k to 3 sts before marker, ssk, k1] twice. 112[128, 140, 156, 172, 188, 200] sts. Repeat these 7 rounds 5 times more. 92[108, 120, 136, 152, 168, 180] sts. Continue in stockinette st until work measures 14.75 inches from underarm, or 1.25 inches less than desired length to lower edge. K 1 round, evenly decreasing 2 sts. 90[-, -, -, 150, -, -] sts. K 1 round, evenly increasing 2 sts. 138 sts. Next Round: [K4, p2] to end. Repeat this round 6 times more. Place 35[39, 43, 47, 51, 55, 61] held sts of one sleeve on double-point needles. Join yarn and place marker at center of underarm; join to work in the round. K 17[11, 8, 6, 5, 4, 3] rounds. Decrease Round: K1, k2tog, k to last 3 sts, ssk, k1. Repeat these 18[12, 9, 7, 6, 5, 4] rounds 1[2, 3, 4, 5, 6, 8] times more. 31[33, 35, 37, 39, 41, 43] sts. Continue in stockinette st until work measures 11.75[12.25, 12.75, 13.25, 13.75, 14.25, 14.75] inches from underarm, or 1.25 inches less than desired length to lower edge. Note: Now is a good time to try on sweater, to determine best sleeve length. K 1 round, evenly decreasing 1[3, -, 1, 3, -, 1] sts. 30[30, -, 36, 36, -, 42] sts. K 1 round, increasing 1 st. -[-, 36, -, -, 42] sts. 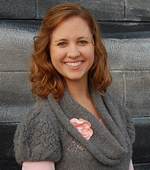 Jordana is the owner of Jordana Paige, a company specializing in knitting bags and knitwear patterns. To view her line of bags and patterns, visit JordanaPaige.com. Support for this pattern can be found here.